WASHINGTON, DC - SEPTEMBER 5: Alex Jones of InfoWars talks to reporters outside a Senate Intelligence Committee hearing concerning foreign influence operations’ use of social media platforms, on Capitol Hill, September 5, 2018 in Washington, DC. Twitter CEO Jack Dorsey and Facebook chief operating officer Sheryl Sandberg faced questions about how foreign operatives use their platforms in attempts to influence and manipulate public opinion. After weeks of deplatforming efforts by social media companies, Infowars founders Alex Jones has lost his last refuge: Twitter. Twitter took the unusual step of confirming its ban of both Alex Jones and Infowars via the Twitter Safety account, citing abusive behavior. Jones’s Twitter page had accumulated nearly 900,000 followers before the suspension, while the Infowars page had accrued around 430,000. According to a Twitter spokesperson speaking with The Daily Beast, the impetus for the suspension stems from an altercation between Jones and CNN reporter Oliver Darcy during yesterday’s Senate Intelligence Committee hearing. Video of the altercation was livestreamed on Twitter. 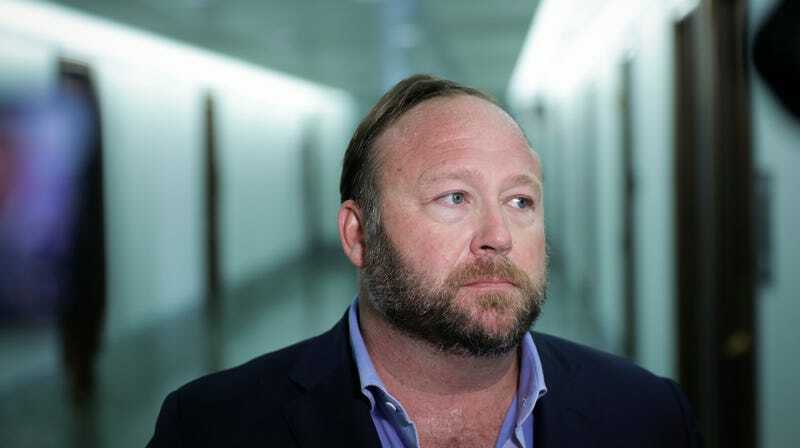 Jones had attended the hearing to, in his own words “face my accusers”—ostensibly meaning Twitter CEO Jack Dorsey and Facebook COO Sheryl Sandberg, both of whom testified regarding their failures to contain misinformation, harassment, and propaganda on their platforms. Currently Jones appears to be broadcasting to Periscope via War Room, an Infowars-affiliated account. We’ve reached out to Twitter for comment and will update when we hear back.